Playing archeologists on Yttygran Island and soaking in tundra springs. As is by now tradition, I awoke to a fog so thick you could cut it with a knife. Truth be told, it rather suits this landscape with its dramatic hills and lush, blossoming tundra this time of year. Today is the day we visit the mysterious Yttygran Island and then Gil'mimyl Hot Springs. During our morning briefing, Rodney told us about the island's history and what exactly makes it so mysterious. 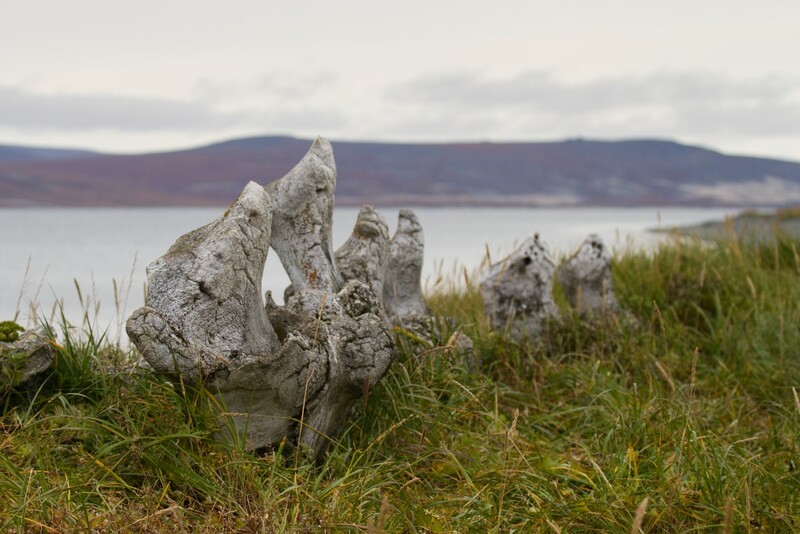 Yttygran is also known as "Whale Bone Alley" due to the large number of whale bones spread along the beach in the form of a pathway. The site dates to the 14th century and its origins and purpose still have scientists scratching their heads. It was almost certainly a ceremonial site as well a meat storage area. What is puzzling is the lack of any substantial settlement in the vicinity, which suggests that it was possibly a communal site situated here because of the abundance of whales nearby. And it's not just the history that makes this place so interesting. The photographic opportunities are phenomenal and the remaining whale bones certainly have an air of mystery about them. Sadly, over the years some of the bones were destroyed either by humans or the elements. Either way, there was no trace of human existence besides our group, and it was great to sit down, admire the fog wrapped around the hills and just be at one with nature for a little while. Next item on the agenda was whale watching. The bay is known to be a great feeding spot for gray whales, so we jumped back into the Zodiacs and jetted off. Indeed, the big and blubbery love this spot! We caught a glimpse of at least four or five of these majestic creatures and a couple of curious seals also bobbed their heads out of the water along the way. Such an eventful morning really gets the appetite going, so we popped back by the "Spirit of Enderby" for lunch. After the shortest siesta known to man, we were back out on the Zodiacs en route to the Gil'mimyl Hot Springs. The springs were a short walk through the swampy tundra but definitely worth the effort! On the way, the birders and naturalists spotted a few winged and legged specimens, the botanists found some berries and mushrooms and someone even discovered a patch of permafrost. It was pretty obvious when we started nearing the springs: the ground looked as though it was smoldering, with steam coming out from all directions. I thought that soaking in hot springs in Iceland or Australia was the peak of coolness. No. This is. I can best sum it up in one word: phantasmagorical. I really could go on trying to describe this experience but I'll save my finger power and let the photos do the talking. A few of the more courageous expedition members ran down for a dip in the ice-cold river. I guess I'm not as Russian as some of the foreigners! The hike back to the Zodiacs was not bad at all; the heat from the springs lasted me all the way back to the shower on the "Spirit of Enderby". Tomorrow promises to be no less exciting because we're going to have the honor of watching - and maybe participating in - the opening of the annual Beringia Arctic Games.